The people of West Papua are sending desperate calls on government officials and leaders of Ghana to assist them in their bid to join the United Nations. 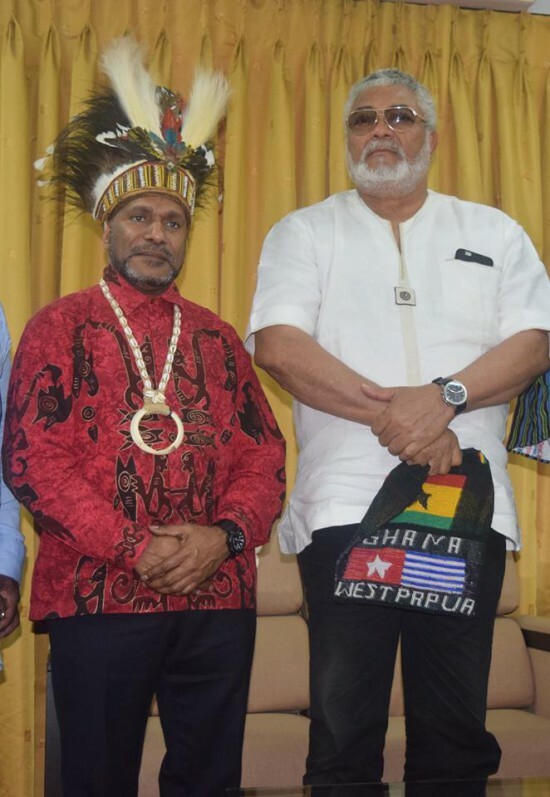 Nobel peace prize nominee and Spokesperson for the United Liberation Movement for West Papua (ULMWP), Chief Benny Wenda joined Ghanaians to mark Ghana's 59th independence anniversary on 6th March, 2016. 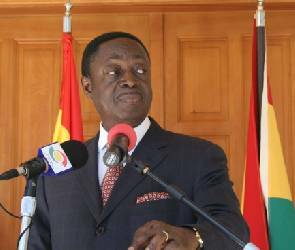 During his stay, he interacted with prominent people in the country, including Reverend Dr Fred Deegbe, former head of the Christian Council of Ghana (CCG), and former presidents Kufuor and Rawlings. Reverend Deegbe prayed for the people of West Papua and Chief Benny Wenda for his visit to Ghana. "God made people and wants people everywhere to be free". He also promised to raise the issue of West Papua at an upcoming church meetings in the USA. Rev Deegbe who is a Senior Pastor at the Calvary Baptist Church served the CCG as General Secretary from July 2003 until April 2013. In a meeting with former President John Agyekum Kufuor and former AU Chair, the former president pledged support for the liberation of the people of West Papua. "It is important that humanity should be central to everything. As a human being you are entitled to humanity. In due course humanity will prevail and you will be free." "The whole world will support you. Not even Indonesia can stop it" "Ghana was once a colony for 100 years, Nkrumah was our liberator, he was a pan africanist and you see yourselves as Africans. What you are doing is the right way. The photos of your people bear witness to a true leader of your people. Some of our paramount chiefs wear feathers. The same but eagle feathers. Despite the distances between our places we are the same. Clearly you are not Indonesian." Former President Jerry John Rawlings has also pledged his support to fight for the independence of the West Papuans. He said "we are honoured to fight for your people. We share a similar history." "It is no surprise to me that you had support from Ghana at the UN in 1969 and that we accepted West Papuan refugees in the 1980's. West Africa has seen slavery, colonial struggles and independence"
"Chief you find yourself in a very painful situation. I suggest that you contact and lobby every congressman, senator and parliamentarian. The European Commission, the AU and all organisations. Keep knocking and knock again, don't let them sleep"
"We will contribute by reminding them who is still colonised"
Flt Lt Jerry John Rawlings, former President of Ghana made the statements when he met with Chief Benny Wenda, spokesman for the United Liberation Movement for West Papua (ULMWP) and Nobel Peace prize nominee. All across Africa and around the world people are finding out about Indonesia's Genocide and illegal colonisation of West Papua. West Papua has a legal right to self determination, de colonisation and independence. West Papua was colonised by the Dutch in 1898 and always administered as “Dutch New Guinea” separate from their “Dutch East Indies” which is now Indonesia. With the promise of independence on 1st December 1970 and on 1st December 1961, the West Papuan national flag was raised with the beginnings of a democratically elected government formed, announcing a 9 year period of peaceful transition towards independence. Politics before Papuans But within months the dream was dead. The newly independent state of Indonesia wanted access to West Papua's vast wealth and the military promptly invaded West Papua. Conflict broke out between the Netherlands, Indonesia and the indigenous population regarding control of the territory. Due to US' fear that failing to appease Indonesia could result in the spread of South East Asian communism, the US government intervened and engineered an agreement between Indonesia and the Netherlands, which in 1962 gave control of West Papua to the United Nations and one year later transferred control to Indonesia. The military occupation and secret genocide The West Papuan people never accepted Indonesia in their country and ever since 1963, have resisted Indonesian rule, first with bows and arrows and what little guns they could and then with peaceful civil resistance.